The problem that Sergio Prado’s urban solution tackles, is that cities require a continual supply of material to fuel their growth. Meanwhile, they simultaneously produce abundant waste – and in a world of limited and depleting resources, the danger is clear. 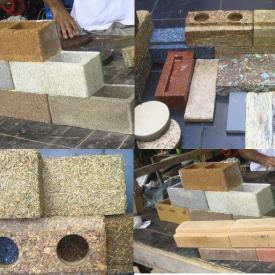 To counter this threat, Prado developed a formula that combines organic resin with urban waste to create renewable and reusable materials to be used in building sustainable houses. The projects aims to fix two foreboding problems in urban development: affordable housing and waste management. The team will originally implement its technology in 14 cities within the Brazilian state of Sergipe, and will fill the mass need with the use of its Clean Plant. The Clean Plant – the organization’s waste conversion plant – will enable the nascent organization to produce on a large scale. The Clean Plant also is central to the organization’s mission in that it transforms the waste into energy (in addition to materials), covering all of the plant’s energy costs and making the endeavor carbon neutral. As if the benefits of this solution were not plentiful enough, the construction process that Prado’s team endorses is easy to learn and to replicate, which will hopefully lead to wide spread implementation. The adaptability of this socio-environmental focused plan is further reinforced by the partnerships that the organization has forged on a national, state and municipal level. With all sides seemingly rooting for the Zero Waste technology, success is promising. The fact that Buenos Aires has more decrepit and deserted houses than there are homeless families, is a pessimistic situation. With homes, homes everywhere, but not a single one to live in, many families often become squatters. But as the famous quote says, “a pessimist sees the difficulty in every opportunity; an optimist sees the opportunity in every difficulty.” Habitat for Humanity Argentina’s Recycling Urban Homes project is undoubtedly comprised of a group of optimists who are renovating the dilapidated homes and renting them to those in need at a market price. The ultimate goal is to provide housing while facilitating savings, and thus lifting families out of poverty. While the Zero Waste team recycles materials used to build homes, Habitat for Humanity recycles the homes themselves, so to speak; fixing up pre-existing homes, as opposed to building new ones affords savings. Beyond the actual construction of the homes, a second challenge is in educating families that paying rent – as opposed to owning a home – is a viable housing solution. Other obstacles that must be hurdled before families can inhabit the repaired homes are bureaucracy associated around housing permissions from the city. The Habitat for Humanity crew is working to advance move-in dates, as the greatest danger to their model would be intrusion on a vacant property. The group hopes to complete their first round of construction by the end of 2011 and to begin renting to families in 2012. Down the line, the buildings will also conduct art and cultural activities, transforming the housing projects into much more than just a place to eat and sleep. Three years ago, a project with similar intent began in a very different location. In 2008 PUSH, an organization committed to bringing affordable housing to the people of Buffalo, expanded its efforts by founding a Green Development Zone (GDZ). 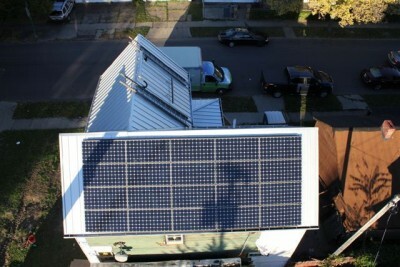 Like it’s parent organization, the GDZ labors to erect affordable housing; however, GDZ uniquely focuses its investments in “green” housing, implementing geo-thermal and solar energy, urban agriculture and green job training. The group very quickly attracted hundreds of neighborhood participants who have constructed 11 units of inexpensive housing to date, with 20 more in the works. Using renewable energy, and harnessing communal manpower are the keys to GDZ’s innovation. GDZ also will incorporate urban agriculture, which will further achieve sustainability by bringing renewable energy and even food to inhabitants. As we know, although green development is more expensive than regular development, the costs are expected to pay for themselves as the sustainable and renewable features kick in over time. (For more, see the video below).